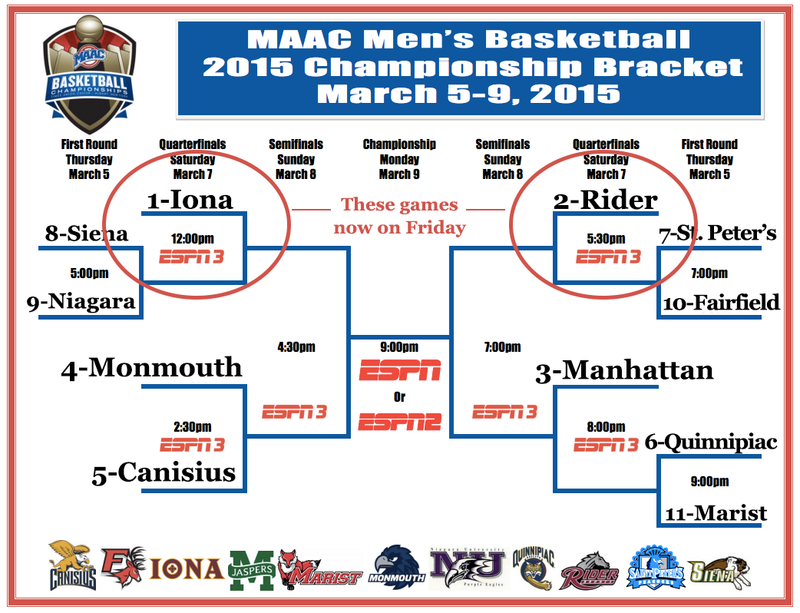 “The efforts of the administrators and coaches to adjust the format to provide an advantage to the top two seeds was prompted by a general recognition by the MAAC membership that not enough reward was being assessed to regular season success by the previous format,” MAAC commissioner Rich Ensor said in the press release. The vote for the schedule change was 9-1-1, with Manhattan opposed and Quinnipiac abstaining, Ensor said. Manhattan coach Steve Masiello said on Twitter that he’d prefer the 11th-place team not even make the tournament. The top two seeds — ideally, the teams the conference would like to represent it in the NCAA tournament — have met in four of the last 10 MAAC Championship games, but only once in the last five seasons. Arranging the conference tournament to help the top seeds is not a new idea. The Mid-American Conference, for instance, gives its top two teams a bye straight into the semifinals.